Professionally designed, content-packed 259 page manual (129 double spreads, A4 size pages) by pro photographer and writer Tony Page. A professionally designed, beautifully illustrated 259 page manual (129 double spreads, A4 size pages). It provides you with a personal photographic armoury of creative tools, ninja practical tips and downright cunning techniques that will transform your travel images and the way you shoot on the road. Getting the right gear, and what you really need (hint: it mostly depends on what you want to do with your photos later). Preparations for travel, packing and general security on the road - at the airport, at the hotel, and out and about. Key Guerrilla Travel Photography basics, dealing with the general themes of time (and how to make the most of it), light (even when it’s not so good) and subject (making the right decisions as to what to photograph). The real nitty-gritty of shooting stuff the guerrilla travel photographer way: people, landscapes, urbanscapes, interiors, and night shots (this is gold). You can win the battle to get better travel photographs. Get solid information that you can use right away to improve your travel photography, with a minimum of technical jargon. 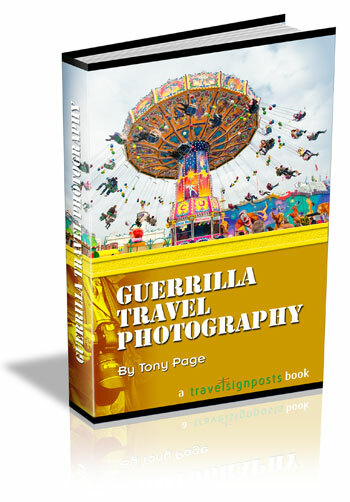 Grab your copy of Guerrilla Travel Photography today and get ready to lock and load. Satisfaction Guarantee: If the "Guerrilla Travel Photography" ebook isn’t everything you were expecting, simply notify me within 56 days and I will refund your money immediately. Includes bonus software: The "Guerrilla Travel Photography Photo Organizer"